Tiles or Studs: Custom Hot Wheels Drag Bus and LEGO Minifigure in the same box! Custom Hot Wheels Drag Bus and LEGO Minifigure in the same box! I'm going to share something very unique this time. I'm both fan of LEGO and Hot Wheels therefore this post is really exiting for me. 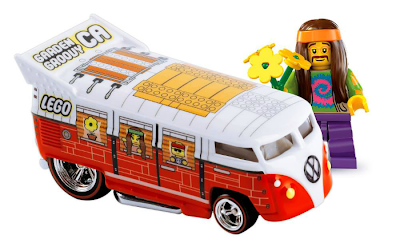 Famous Hot Wheels custom designer Bryan Pope has made a rare Hot Wheels Drag Bus set using LEGO Brick/Minifig decals and combined it with a LEGO Collectible Minifigure (Series 7 - Hippie). This set is specially produced for the Hot Wheels Collectors Convention 2013. There is even a ebay auction about one of these item right now. Check out the beautiful box design of this set. THe LEGO minifigure and the Hot Wheels Drag Bus get together in the same box for the first time. It has brick decals on top of the custom drag bus.